It has been suggested that the content of this page should be merged with Take the last big point. Getting the last big move in Fuseki is a concept actually not too complicated - if kept in mind. 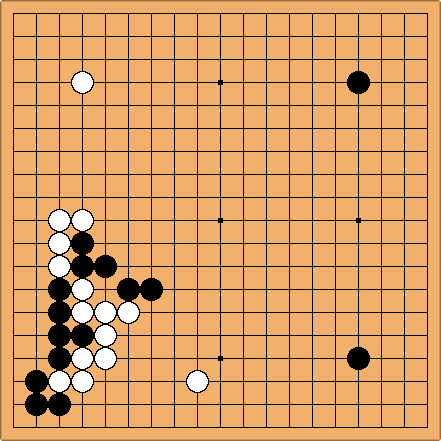 Quote: "To use this principle can help you get(ting) an easy opening, without getting involved in local fights too early and (thereby) losing the control of the game"
but White gets sente for the last fuseki moves. Correct: Here it is Black who takes the last Fuseki points. Afterwards e.g. White a and checking-extension black b could end in a normal Gote sequence for White. Afterwards (!) = is the move which Black wanted to get and now will get. See also "Tedomari in the opening" discussed down at tedomari and takethelastbigpoint (in Fuseki). I find this aspect a very exciting one, when replaying games of better players: the so-called "tenuki" is just better play. The balance between thinking globally and local safety is shown.